In Martin Scorsese’s Cape Fear (1991), Jessica Lange and Nick Nolte are lying in bed discussing the increasingly disturbing harassment they are experiencing at the hands of an ex-convict played by Robert De Niro. While Nolte is fearful, Lange seems fascinated by the prospect, almost welcoming the intrusion into their family life. As she says, she wants to “see how strong we are, or how weak.” Dianne Wiest, in Tim Burton’s Edward Scissorhands (1990), is bolder in testing the limits of family solidarity, literally fetching the scissor-handed bogeyman (Johnny Depp) and installing him at the centre of their Levittesque suburban home (1). In their own way, both women display a profound and genuine ambivalence over their particular experience of family. It is this very ambivalence, and the extent of the experience of family ambivalence, that Murray Pomerance and his colleagues have described in this outstanding collection of film essays. If, as an edited collection, this says anything in particular, it is that in Hollywood cinema, family is everything. Of course, this is almost the same as saying that the family is nothing in particular. But what is clear across the board here is that neither the authors, nor the films and filmmakers they analyse, are constrained to force the family into an inadequate academic label. Clearly, the very self-consciousness of the family that they capture in their work renders the idea of labelling absurd. The way in which these essays capture the sense of genuine ambivalence that we have read in the examples of Scorsese and Burton above is best described by their attention to the perverse. So often the family in Hollywood cinema, like a perversion, seems to mark some wholly inadequate response to a yearning that dare not speak its name. It is an experience of a fumbling teenage foreplay to the very grandest of unrealised passions. The problems that beset the family as perversion range around the issue that the family is supposed to be one friendly and comforting thing but it is always so many other things. These other things are not only numerous but so dangerously contradictory to our preferred vision of the family. Furthermore, these problems seem so easy to name, whereas naming the single, comforting entity seems impossible. Ultimately, what all these essays are getting at is the weird practice of Hollywood filmic representation and critical evaluation of the family that revolves around the struggle over three questions: what is the family, is it likely to survive, and do we really want it anyway? What stands out in the freshness of the problem-raising work here by Pomerance and his colleagues is that, in a sense, we think we already know it all. These essays remind us that the Hollywood family never goes out of date. Although the critical voice is constantly trying to assert that none of these family problems are new, we are still highly capable of gasping with amazement at some new expression of the contradictions about the family that seem to make it so indestructible. As we are invited to look at the experience and cinematic representation of the family from a range of challenging positions, we are also asked to participate. Pomerance is keen to have us consider this collection and its contributors as a family of its own, “with voices disparate and energetic, passionate and convicted, argumentative and agreeable, mellowed like aged wine and fresh on the street” (p. 10). The multiple voices and concerns of both established and relatively new film scholars in this collection ensure its readers a number of keys to the door of the cinematic family home. Therein Pomerance and his colleagues reveal the familial interactions (murder, betrayal, insult, loyalty, courtship, magic, misunderstanding and desire) of familial characters (the dying patriarch, the transformed father, the good mother, the abandoned child and the queer parent) within familial spaces (the suburbs, the city, the Hollywood studio, the house, the fan-magazine and the frontier). From this, we are prompted to construct a set of familial faces (the heteronormative nuclear family, the non-biological family, the step family, the white colonial family, the animated family, the postmodern family, the queer family, and the absent family). These essays are accessible, well articulated and stimulating. They assume a degree of film knowledge just as much as they do some experience of family. But this does not exclude those unfamiliar with the particular texts. Rather, the discussion of these films sparks an urge to head to the local video store to revisit old friends and to make new ones. Thus, as readers, we are invited along to an eclectic and provocative family gathering where we are presented with morsels of the cinematic familial for our contemplation, consumption and criticism. This collection addresses a satisfying array of texts, from 1950s fan-magazines and contemporary television commercials to films such as Mildred Pierce (Michael Curtiz, 1945) and Mary Poppins (Robert Stevenson, 1964), Brokeback Mountain (Ang Lee, 2005) and Cat on a Hot Tin Roof (Richard Brooks, 1958). It addresses genre film such as the Sirkian melodrama All I Desire (Douglas Sirk, 1953), film noir The Locket (John Brahm, 1946), and the classic teen film Rebel Without a Cause (Nicholas Ray, 1955). It also acknowledges the contribution of the likes of Robert Altman (Gosford Park, 2001), Todd Haynes (Far From Heaven, 2002) and Jacques Tourneur (I Walked with a Zombie, 1943) to the cinematic family. In this collection, analysis of these texts is arranged according to a compelling set of contexts and implications. Presenting the essays in sections concerning genre, politics and desire respectively provides focused consideration but does not prevent the inevitable and necessary overlap and interaction of ideas across the book. The focus of this collection is largely on North American cinema; however, analysis is not restricted to films from a particular period or production framework. Discussion of Panic Room (David Fincher, 2002) and The Royal Tenenbaums (Wes Anderson, 2001) is side-by-side with examination of the films of D.W. Griffith and Alfred Hitchcock. Nor is it inconceivable to ask similar questions of the familial in other cinemas. Therefore, the scope and pertinence of this collection befits its subject matter and suggests the beginning of a wider discussion of the family in film. A Family Affair makes it evident that the definition of the filmic family is incredibly difficult to pin down. It is not so much elusive as expansive. The examination of George Cukor’s family comedy The Philadelphia Story (1940) in the same collection as Kevin Costner’s 2003 return to the classic western Open Range illustrates the breadth of this discussion and suggests that attempting to contain the filmic family is a pointless exercise. To do so would be to miss out on the juicy bits. Through this fresh and varied approach to what would seem to be a ubiquitous idea (even, paradoxically, in its absence), we are also asked to reassess and revisit those most familiar of films, and to explore those to which we are yet to become acquainted. Surely this inspiration and enthusiasm to watch is the joy of both writing and reading about film? 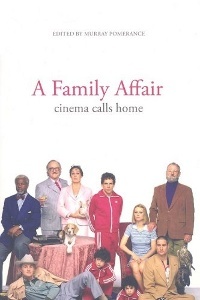 A Family Affair: Cinema Calls Home, edited by Murray Pomerance, Wallflower Press, London, 2008. Willliam Levitt was a real-estate developer whose firm Levitt and Sons planned and constructed several suburban communities in the United States, including Levittown, New York and Levittown, Pennsylvania. These communities became emblematic of postwar mass-produced suburbia. Anika Ervin-Ward is a PhD candidate and Tutor in the School of Culture and Communication at the University of Melbourne. Her dissertation examines the intersection of gender, hysteria and cold war culture in the films of Tim Burton.